Consider a person within an organization in charge of delivering a product or service to a customer. He would communicate with the customer using email and make sure that she knows what is happening regarding her order or request. He would be handling internal communications (probably via email) with his colleagues to coordinate and deliver the product or service to the customer to her expectations. Provided everything goes smoothly and a limited number of messages and conversations occur - coordination using the email method works fine. However, something always goes wrong and the email that answers the troubled question is buried in the communication paths. Messages and promises are spread through-out the email conversation and expecations are sometimes missed, causing angst and customer dissatisfaction. At Ceptara, we recognize that email is limited in its ability to track action. That is one reason why we've developed products to help teams better collaborate using our FocusSync service and SharePoint as faciliatation platforms. However, learning a new collaboration platform can be ornerous and often many people will not 'join' the platform. Hence, email still has its uses to faciliate action. FocusMe for Outlook uses the notion of a "tracking task" that serves as the central object associated with communication around a specific action (the task). Email messages are tagged with a unique identifier that is used to bring different conversations together and display them for a given task. To initiate a conversation from the task, the 'Message' button is selected, which then creates a tagged email message that can be sent to the Customer. Any follow-on exchanges include the reference tag (which is unique to the initiating task) creating a two way link between the task and the email message(s). If "Me" wanted to see all of the conversations associated with the task, he would select the "Related Messages" button on the Task ribbon. Conversely, any message that is connected to a task can display the connected task using the right click context menu "Task Info..." to open the associated task connected to the selected e-mail. The coordinator (Me) can use the 'Message' button for internal communications as well, which would connect those conversations to the tracking task. If a Colleague starts a conversation and the coordinator (Me) wants to link it to the task, he can do that by dragging the message from his Inbox onto the task and use the "Link to Task" menu item. This will tag his copy of the email with the reference ID and he can then assure that the follow-on messages are also linked to the task by replying to or forwarding the newly tagged message in his Inbox. Two email conversations are listed in the window. Each conversation can be opened using the right click context menu "Open Conversation..." - this will open the Conversation Manager window displaying a hierarchical view of the messages within the conversation. The displayed conversation above has a single thread with two messages within the thread. The tree display will show all threads and messages for the selected conversation. 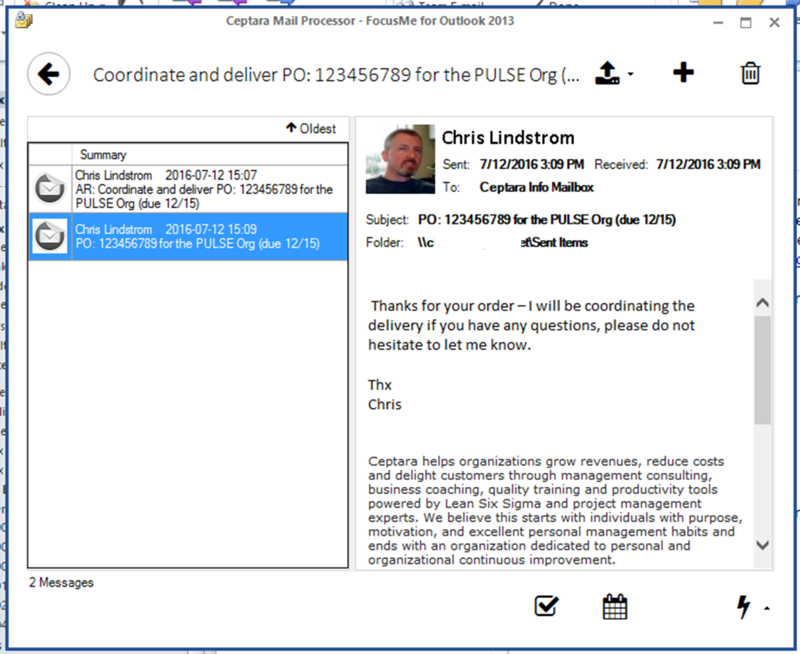 FocusMe uses the Outlook conversation thread framework to analyze the message threads. The sender information includes any other conversations for which they are participating, projects with which they are associated, and any tasks that have been delegated to them from the coordinator. The FocusMe tool provides a mechanism to connect email conversations with action tracking tasks. Utilizing the task as the center action object, i.e. keeping track of all promises and expectations and using FocusMe assures that any message exchanged in service of the action are coordinated and easily displayed to assure nothing is lost and customer expectations are consistently met.